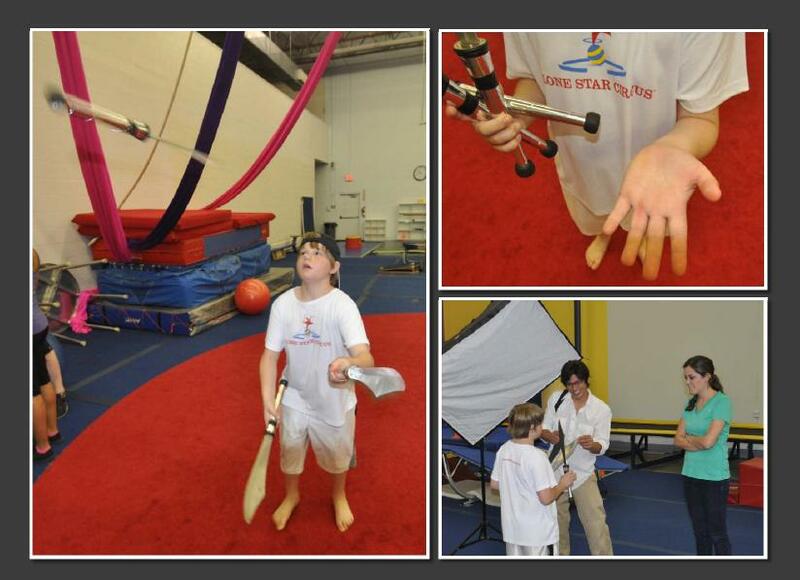 This week, the Lone Star Circus School is having the first of two day camps. And Nic Rainone (Zerp the Clown) brought juggling knives to camp. I’ve been wanting to learn to juggle knives for a long time, but they’re really expensive (like $50 each), and I didn’t know anybody who had any. On Tuesday, Nic let me practice with them. He’s a really good clown, and a good juggler, too. And he’s a good coach. I got to work with him a couple of times before for shows, but this was the first time I had him as a teacher. He’s really, really good! It was hard, but I did ok. It’s kind of scary when those big knives come at you, so I kept moving out of the way. Once I started catching them it was ok. There’s this one really funny photo my grandpa took where one of the knives looks as if it is coming right at my head, and I look pretty scared. But it didn’t come close to my head, and I actually caught it. But I like the picture a lot. My grandmother always says, “The first cut is the deepest” (she means that when someone hurts your feelings, it’s always the worst the first time it happens). Luckily, the first cut wasn’t too deep when it came to learning to juggle knives. You can barely see the cut on my hand from where I caught the wrong end of the knife. So here are some pictures of me learning to juggle knives — and the cut I got to prove that they really are sharp! Danny Fulgencio, a photographer for the Dallas Advocate, came to class today to take pictures of some of the kids for a story the magazine is doing. He took my picture, too. So here are some photos of me learning to juggle knives, and of the photographer taking my picture, plus some other random photos my grandpa took this morning. There is a video, and I will try to post it later. 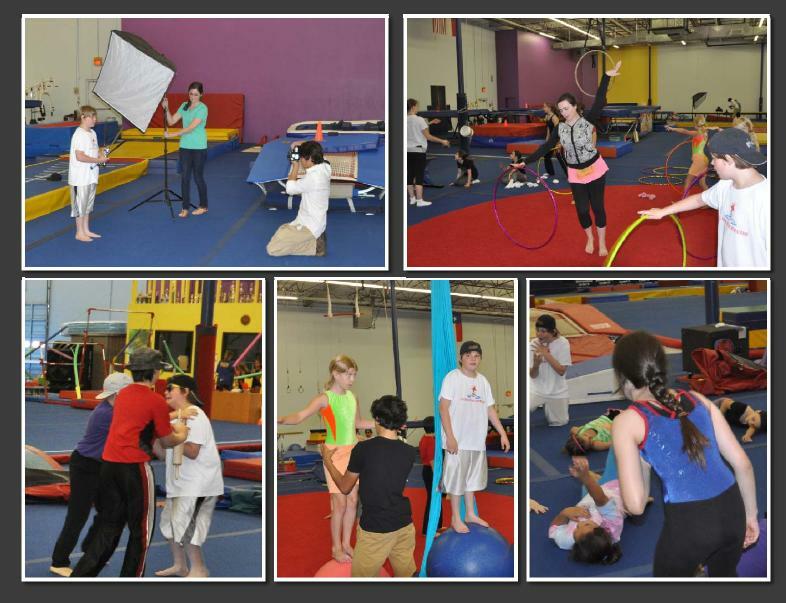 Circus camp is a lot of fun — there’s another session July 15-19. You should come — and don’t worry, nobody will make you juggle knives. (They won’t even let you touch them unless you’re already a pretty advanced juggler.) You don’t have to know any circus skills. You’ll learn some, and have a lot of fun. I won’t be at the second session because I’m going to Circus Smirkus in July, but I’m glad I got to come to the first session. It’s just half a day, and it doesn’t cost very much. So check it out at the Lone Star Circus website. 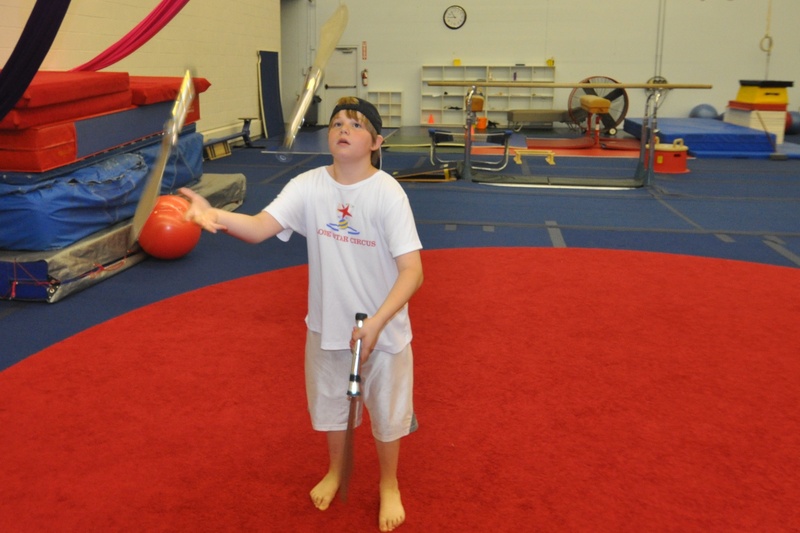 Of course, juggling isn’t all we do at circus camp. There’s a lot of aerial stuff (silks, trapeze, lyra), clowning, skits, balancing on balls and the rola-bola, and the slack wire. But these are just some random photos my grandpa took at camp today. If you watch this video, just remember I had never touched juggling knives until Tuesday. I wasn’t at circus on Wednesday — I had an audition out of town (THAT’S another story!) — and this was taken on Thursday morning. So by the time this was shot, I’d practiced for maybe half an hour, and I had cut my hand. So don’t laugh too much, ok? I am going to get better at this!